A simple design is sometimes the best, and this pair of cuff links shows that simple can also be elegant. This design is very streamlined and will fit with anything that its wearer might want to wear it with. They're made out of stainless steel and feature a brushed finish, giving the metal itself a bit of a pleasing pattern. 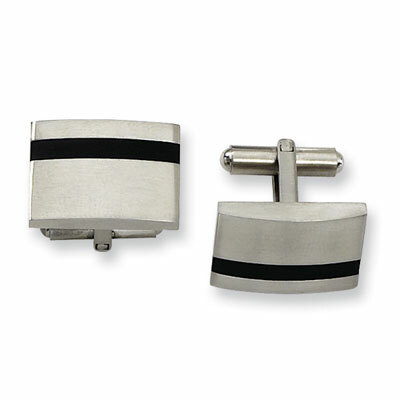 At one end of each cuff link is a simple black band, made with black rubber. The contrast is very striking and will be sure to get the wearer compliments. These are definitely the right fashion choice for you and the perfect gift for someone who enjoys the finer things in life. A rubber accent line are a perfect additional to these stainless steel brushed finish cuff links. Cuff links measure 20mm (13/16") x 14mm (9/16"). We guarantee our Stainless Steel Cuff Links with Black Rubber Accent to be high quality, authentic jewelry, as described above.